So much depends on being a lady. A true one knows that thequestion, "How are you today?" isn't an invitation for her to unload the day'sordeals. She knows that her unsolicited opinion of a friend's fuzzy lime greensweater dress isn't necessary, and she certainly knows better than to nag orspout gender cliches when the man in her life refuses to stop and ask fordirections. As a Lady Would Sayis every & ;woman's guide to being delicatein an indelicate world of awkward situations, difficult people, and thornysocial dynamics. 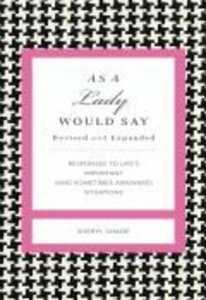 Sheryl Shade's clever cataloging of real-world scenarios is ahumorous look at how a lady should respond in any number of life's irksome situations,along with a guide to which words should never leave her mouth. Get ready toquestion your own feminine sensibilities, and examine the way you interact withthe world around you. So much depends on being a lady. A true one knows that the question, ?How are you today?? isn?t an invitation for her to unload the day's ordeals. She knows that her unsolicited opinion of a friend's fuzzy lime green sweater dress isn?t necessary, and she certainly knows better than to nag or spout gender clich s when the man in her life refuses to stop and ask for directions. As a Lady Would Say is every woman's guide to being delicate in an indelicate world of awkward situations, difficult people, and thorny social dynamics. Sheryl Shade's clever cataloging of real-world scenarios is a humorous look at how a lady should respond in any number of life's irksome situations, along with a guide to which words should never leave her mouth. Get ready to question your own feminine sensibilities, and examine the way you interact with the world around you. About "As a Lady Would Say"
Shade is Principal of Shade Global, a marketing consulting firm based in New York and Florida.